Christmas is quickly approaching, and that means New Years Eve is right around the corner! It's time to start thinking about your NYE plans, and more importantly, your outfit! There are a few different directions to take when you are trying to decide on a NYE outfit. Some go the sequins route, other's like to dress a little bit more casual. 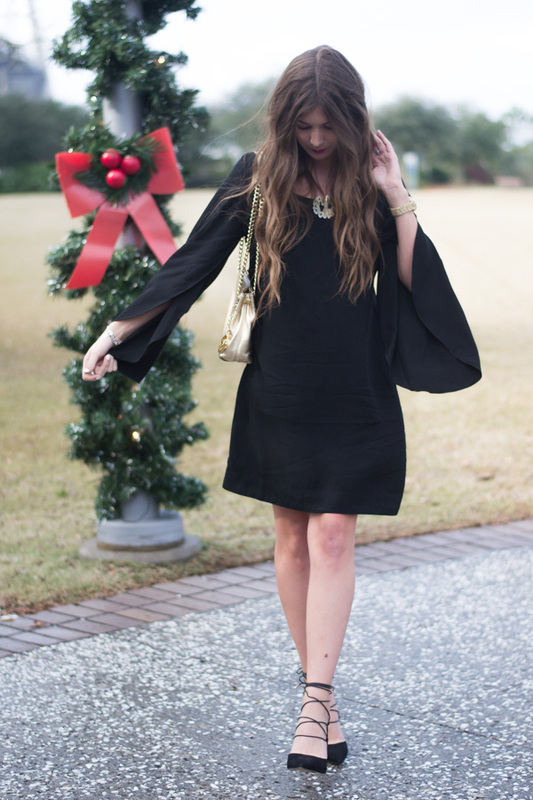 Today I'm giving you some inspiration to take your LBD to NYE! If you're not one to dress in all sequins and want to go for a more simple look, then I recommend going with a little black dress! This Escapade Living Margot dress is the perfect LBD that can be dressed up or dressed down! It is so easy to take this simple dress and dress it up with a pair of strappy heels and some accessories! If you live in a colder place, you could add a nice faux fur coat to complete your outfit! It's been so gloomy in Charleston the past few days, so that's why these pictures are a tad on the darker side! My friend Megan is coming into town this weekend and I am going to show her around Charleston a little bit before heading home to Maryland for this holidays! I hope the Weather clears up for her visit! Loving the simplicity of this dress and the minimalistic jewelry adds just the right touch to make for a classic look. You look fabulous. Happy holidays and thanks for sharing. Love a simple black dress! And I agree with Shateka, the minimal jewelry gives it such a classic look! I'm hoping the weather clears up as well and safe travels to Maryland! This dress is SO perfect for NYE! Love the sleeves!!! what a gorgeous little black dress! I love the sleeves and the shoes that you've paired it with! The cutest combination! Loving the sleeves on the dress & how you paired it with the lace-ups. And your lip color is fab! You look gorgeous! Love this LBD and especially those Sam Edelman shoes! Loving the pretty sleeves on this dress! Perfect for the holidays or NYE! Now this is a step up from the LBD. Love those arms. The sleeves make this so appropriate for holiday gathering in New England. The lip and the shoes have me swooning!!!! Love it! I love that dress! And your hair is gorgeous... I love the soft waves! Love the sleeves on that dress! SO cute! Love the oversized monogrammed necklace too!! Wow, those sleeves! Killin' it. Love the classic LBD, and this one with the sleeves adds just the perfect touch. Such a pretty NYE look. This LBD is so gorgeous! The sleeves are everything and adds so much flare to this dress! So obsessed with your heels too! I can't get enough of the lace-up trend, so seeexy, heeh! 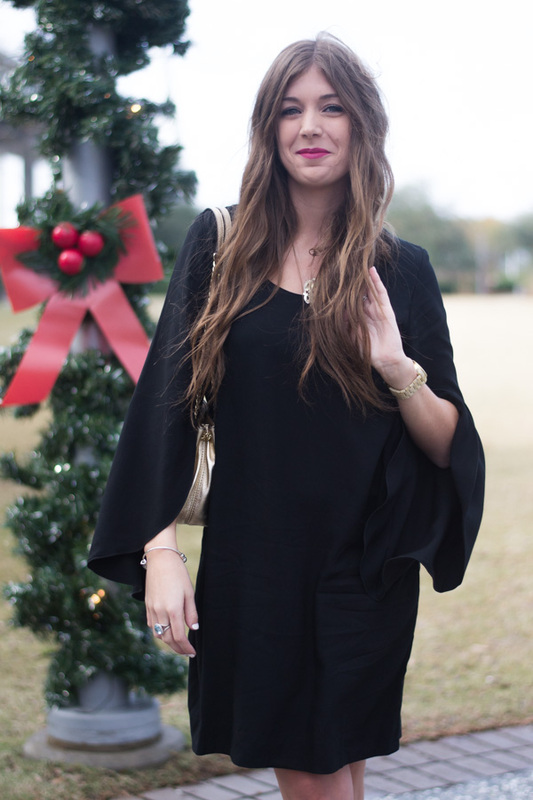 What a fun take on bell sleeves! I love the simplicity of the LBD paired with the unique cut. Looking gorg, girl! Nice holiday look, enjoy your visit with your friend. How pretty! I just love the shoes too! Love this little black dress on you and the heels!! I've been looking for a pair just like them! 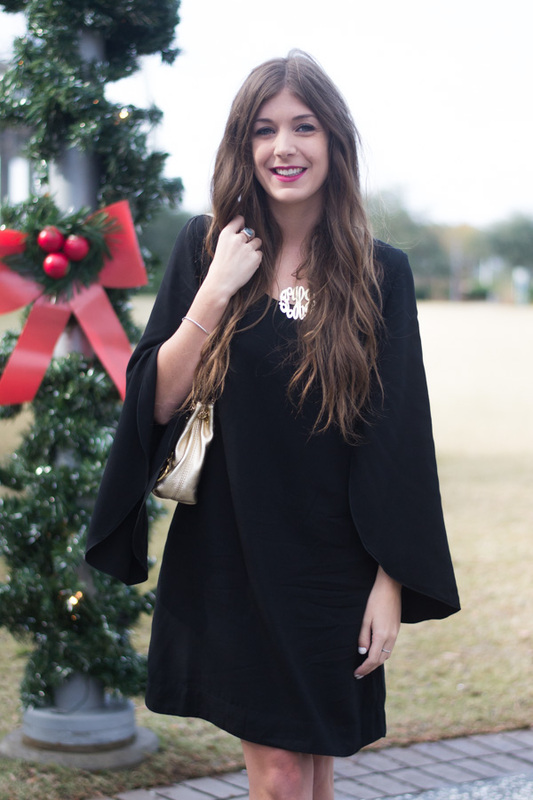 The classic LBD is perfect for every occasion, especially for a classic New Years look! Now I'm obsessed with this dress! It's beautiful and unique. You look fabulous and like you're ready for a fun party! Loving the sleeves on that dress! Those heels are also totally adorable. Love the sleeve detail on this dress! So perfect for New Years! such a cute dress, love the bell sleeves! I love the sleeves on this dress! This dress is so fun! I love this look! Those sleeves are perfect!! I just adore that dress so much. You look gorgeous my friend!! I so need this dress for the holidays. Love how you styled it. What a pretty little dress. Love the sleeves.